Who Says You Can't Mix Business With "New Orleans Style" Pleasure! Born from a passion and love for our Louisiana culture, we have been serving up our unique "New Orleans Style" spin on great barbeque since we first opened our doors on Mardi Gras Day in 2002. VooDoo BBQ, like its home city, is a blend of influences, tastes, spices and attitudes that combine to create something unique. It's a cuisine that respects established culinary traditions — Southern, Caribbean, Creole, Cajun, French — but combines them in fresh ways to serve up something new. After nearly a decade of proving ourselves in the ultra-competitive food arena of south Louisiana, we are now expanding to embrace and bring our unique approach to barbeque to new markets all across the country. VooDoo BBQ is a business that's positioning itself at the crest of some of the hottest trends in the restaurant industry: the lean toward "comfort food" and colorful, ethnic cuisine; the emergence of the "fast-casual" restaurant, the fastest-growing segment in the industry; the thriving franchise industry; and the evergreen popularity of the cuisine of New Orleans, one of the world's great food cities. "Come Experience the Magic" and share in our passion for great food, friendly service and inviting atmosphere! At VooDoo, we take pride in serving our beef, chicken and pork barbecue competition-style, which means it's perfectly seasoned and smoked and served as is, and we allow our guests to add sauce to taste. It all starts with our preferred slow-smoking process. Our premium quality Beef Brisket, Pulled Pork, Louisiana Cajun Sausage, Chicken, and Ribs are blended with Cajun, Creole and Caribbean spices to create our magical flavor and smoked over Louisiana Pecan and Oak woods for up to 18 hours. "To Sauce or Not To Sauce"
All too often it seems to have become standard practice for barbeque joints to drown their meets in sauce. We believe sauce should BRING OUT - NOT COVER UP - the natural flavor of meat which is why we allow our guests to choose. Our guests have the option to choose from our three signature sauces which represent different geographical preferences. 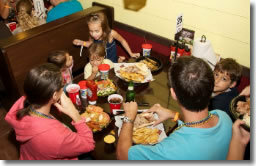 And we don't aim for just the crowd that craves barbecue, either — we serve great po-boy sandwiches, hamburgers, seafood dishes, salads and starter items like gumbo, too, which means VooDoo BBQ is a perfect choice for the entire family looking for a great-tasting, affordable meal served quickly. The food is only part of the VooDoo recipe. We want to give diners an experience, a combination of food, sound and ambience that amounts to a 30-to-45 minute New Orleans vacation. We make our stores bright, clean and inviting, with French Quarter interior design touches and Louisiana music — zydeco, jazz, R&B — playing over the PA system. We're not aiming for the traditional "Bubba's BBQ Shack" vibe; we want a fresh space that's comfortable for everyone. 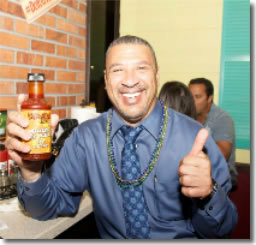 Mixing Business With "New Orleans Style" Pleasure Never Tasted So Good! 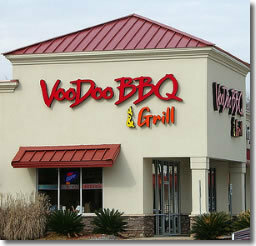 Click on Request Information for FREE info on how to open a VooDoo BBQ & Grill franchise today! Please Note: This VooDoo BBQ & Grill franchise opportunity and other franchise business opportunities, businesses and franchises for sale on this web site are not to be considered as an "offering", "franchise offering", suggestion or recommendation by Franchise Leader™. This advertisement depends entirely on the truthfulness of the information provided by our advertisers which includes, but is not limited to, franchisers, franchise brokers, franchise consultants and business brokers. Franchise Leader™ recommends that you consult a lawyer, financial consultant, accountant or professional advisor before buying a franchise or business opportunity or any type of business. By using this form or any part of our website, you have agreed to all terms and conditions of Franchise Leader™. Please review our Terms & Conditions for more information.